EPDM (ethylene propylene diene monomer) is a synthetic rubber membrane with elastic properties commonly used to cover low-slope roofs on both residential homes and commercial structures. Its manufacture includes the use of cross-linked polymers to improve elasticity, strength, and durability.Polymers are custom-designed molecules. Cross-linked molecules are those that bond at the atomic level, which greatly increases their strength and durability. The polymer industry, in general, includes many products in addition to roofing materials. In the U.S. alone, the sales of such products are worth over $425 billion a year. EPDM is produced by a number of different manufacturers. It’s commonly available in thicknesses from 45 mils to 60 mils, and may or may not be reinforced. At least one manufacturer offers it in sheets up to 100 feet long and 50 feet wide, although standard width is typically 10 feet. Larger sheets are an advantage because the roof will have fewer seams, which are potential leakage points.Other potential leakage points are penetrations, roof edges, and junctions, such as headwalls and sidewalls. For mechanically attached systems, fastener penetrations are also potential leakage points. EPDM typically has a perm rating of 1 or less, making it a moisture barrier instead of a moisture retarder. EPDM is known as a single-ply roofing system because it is a single membrane, as opposed to a built-up membrane consisting of multiple layers bonded together.Some of the main advantages of EPDM are its outstanding resistance to deterioration from heat, ozone, and weather. 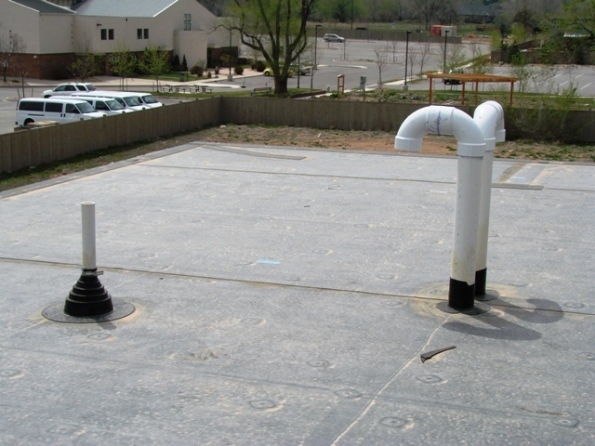 Compared to other systems used for similar purposes, EPDM performs especially well in cold weather. ballasted, in which an aggregate such as gravel, generally called ballast, is installed on top of the membrane. Aggregate is typically ¾-inch to 1½ inches in diameter (#3 or #4 stone). The EPDM membrane is held in place by the weight of the ballast. The advantage of ballast is that it allows expansion and contraction of the membrane. Ballast systems also typically use larger sheets with factory-made seams which are superior to field seams. The disadvantages of ballast is that such systems are heavy — 10 to 12 pounds per square foot — and have limited wind resistance. Seams have been weak points in EPDM installations for many years. 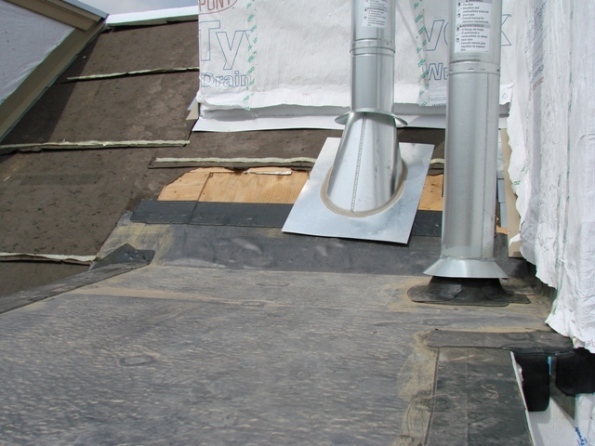 Field experience has shown that seams that are watertight when the roof is installed often develop defects within the first three years after installation. They may fail due to application errors or adhesive failure. Cleaning, priming and adhesive application must be done correctly, and failure to perform any one of the three steps may result in failure of a seam. The thickness of the adhesive layer is more important than surface cleanliness in developing a lasting bond. However, both are important. For some new, critical-occupancy requirements, all field seams (seams created on-site) are double-sealed by adding an additional strip of the membrane over the sealed lap. Double-sealed membranes may carry an extended warranty. Because seam adhesives are adversely affected by moisture, EPDM should not be installed over materials with a high-moisture content. Ripples and buckling are sometimes forced into the seam during installation. While these seams may be watertight soon after installation, they are more likely to fail than seams installed correctly. Methods exist to refurbish existing seams that are failing. At roof-wall junctions, the EPDM should be extended up the wall behind the exterior wall-covering material. At changes of roof pitch, the EPDM should extend up onto the steeper pitch. Older installations may have wall flashing consisting of uncured neoprene, instead of cured (vulcanized) EPDM. It was once thought that the uncured neoprene would conform better to shapes and would vulcanize with exposure to heat and sunlight. Instead, it tends to craze-crack, which appears as random cracking. Membrane shrinkage is a common problem even with recent installations. This can result in tenting at terminations and wrinkling at penetrations. It may pull flashing loose or cause craze-cracking. Shrinkage can also stress the seams. The correction is to cut the membrane, let it adjust, and then patch it with a strip of EPDM. This is not something that can be done by a homeowner. Fasteners may back out due to over-tightening during original installation, or they may be pulled loose by repeated billowing of the membrane under a wind load. Repair involves slitting the membrane, replacing the fastener, and then patching the membrane. EPDM can be damaged by exposure to grease, animal fats, oils and petroleum solvents. Examples of locations where these problems might appear are at an exhaust vent from a kitchen, and leakage or spillage related to roof-mounted air-conditioning equipment. If there are areas on the roof where any of these conditions is a continuing problem, have another material installed in place of the EPDM. To reduce the cooling season heat load, EPDM, which is black, is frequently covered with an energy-reflective white coating. If the coat is flaking off, it needs to be removed, although removal can be difficult and may be expensive. If flaking is evident during an inspection, the condition should be evaluated by a specialist. Evaluation should include contacting the coating manufacturer to confirm that the coating was designed for long-term compatibility with the membrane. Ballast may be displaced by wind scour or by billowing. It typically appears as a heart-shaped section near the roof’s corners, where velocities tend to be highest. As a correction, pavers can be installed, but they require a pad to prevent abrasion. A better solution is often larger aggregate applied at 20 to 25 pounds per square foot for 10 to 15 feet in from the roof edge. On low-slope roofs, water may sometimes collect in low spots. This is called ponding. Seams which get soaked by ponding may fail. Even when the roof is dry, you can usually spot the areas that have ponding problems by the sediment that collects in them, or the dried rings that the evaporated moisture leaves behind. Areas of heavy travel are especially subject to damage from abrasion and cuts to the membrane. This can damage the underlying substrate. These areas should have an extra layer of the sacrificial membrane for protection. It is difficult to start a tear in both reinforced and unreinforced EPDM, but once a tear starts, it propagates relatively easily in unreinforced EPDM. Since tearing is more common with mechanically fastened systems, if you see a mechanically fastened roof with extensive tearing, it may not be reinforced EPDM. EPDM is made by a number of different manufacturers and will vary slightly in chemical composition and properties but, in general, it fails in the ways described above.